Amelia North needs refuge, and finds it--in Refuge, Illinois. Stranded there after a car wreck, the single mother expects to be cold-shouldered. After all, she's already been rejected by her parents, her church and her daughter's father. Instead, she finds a town full of people with open hands and open hearts...including pararescue jumper Ben Dillinger. Ben wants to help Amelia and her daughter find safety and stability. Instead, he finds himself free-falling--right into love with the ready-made family. This is the third book in "Wings of Refuge" series, and it covers the life of two more future Refuge citizens. PJ, Ben Dillinger rescues Amelia and Reece after Amelia passed out and crashed into a tree. It was love at first sight, but Amelia had been mistreated in the past and didn't want to believe there were nice people in the world. Ben was persistent, though, and never gave up on Amelia. There were several issues covered in this book. Amelia's past sin of fornication had followed her and caused her parents and church to turn away from her. The father of her child had beaten her so badly, he put her in the hospital. But Amelia was trying to come to terms with all that and make a life for her and Reece. Then there was Ben. He had loving parents and a brother. His father wasn't well, but Ben couldn't get him to go to the doctor. Ben's brother, Hutton, had Down Syndrome. Like many young children, Ben didn't treat Hutton very well and was now trying to make up for it. This was not an easy task. Ben felt like a failure and was too ashamed of his failure to admit to Amelia that he had a special need's brother. 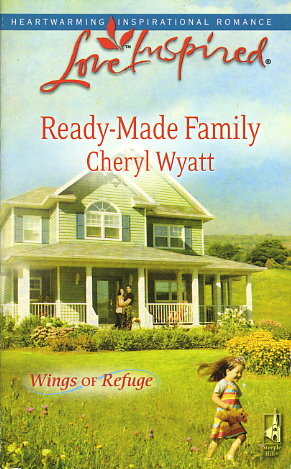 These books that Cheryl Wyatt is writing are so refreshing. There isn't a lot of resentment toward each other for not being perfect. When problems arise, they don't break up - but work together to try and resolve their differences. This book was like a breath of fresh air and I cried through the last three chapters or so. There were so many surprises waiting in the pages - not really unexpected, but pleasant none-the-less!